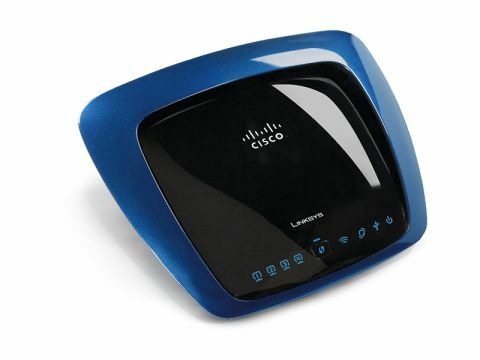 The design of the Linksys N Ultra RangePlus WRT610N is rather funky with a black and metallic blue finish. Made from plastic, the oval design even has a fin on the back, rather like on a sports car, to emphasis the performance of the router. Fortunately, there are no visible antennas to spoil the sleek finish as they are built into the device. On the rear of the router you'll find the standard array of four Gigabit Ethernet ports, modem port and USB. This latter feature works as a Storage Link, so you can attach an external hard drive or USB memory key and run it as a NAS (Network Attached Storage) device. If total performance is what you're looking for, this Linksys router is the perfect choice for you. Instead of simply being one controller chip, it actually packs two 802.11n chips inside, which can run simultaneously, allowing you to dedicate larger portions of bandwidth to more tasks. In effect, this means one chip can handle domestic chores, such as surfing the web, while the other can be used solely for VoIP or gaming. It does this by being able to use the 2.4GHz and 5GHz frequencies, which limits interference. Setting up the router is simple, largely because this is a well-documented procedure, even down to the stickers warning you to run the software before you even think about attaching the hardware. At £64 (inc. VAT), the Linksys Wireless N USB Network Adapter certainly isn't cheap, but it's the perfect accompaniment to the router as it supports dual-band, so you won't suffer from bandwidth lag. When used together, we found performance was excellent and easily the most efficient of the five routers on test. The Linksys N Ultra RangePlus WRT610N's price tag indicates it's a budget or entry-level device, but its abilities suggest otherwise. In fact, this is a premium product with a budget price tag, delivering ease of use and exceptional performance.